Decisions of the International Court of Justice are almost as replete with references to precedent as are decisions of a common law court. Even though previous decisions are not binding, the Court relies upon them as authoritative expressions of its views on decided points of law. 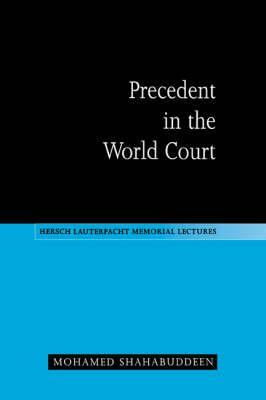 In his book, the distinguished international lawyer Judge Shahabuddeen examines various aspects of this phenomenon. He shows the extent to which the Court is guided by its previous decisions, and discusses the way in which parties to cases are themselves guided by decisions of the Court in framing and presenting their cases. He also traces the possibilities for future development of the system. Judge Shahabuddeen's analysis of the Court is a major contribution to this important subject. Foreword; Preface; List of abbreviations; 1. Introduction; 2. The growth of the Court's case law; 3. Range of precedential resources; 4. The bases of the system; 5. The Advisory Committee of Jurists; 6. The view taken by the League of Nations; 7. The possibility of judge-made international law; 8. Stare decisis; 9. Distinguishing; 10. Departing from a previous decision; 11. Ratio decidendi and obiter dictum; 12. Advisory opinions and decisions of chambers; 13. The precedential impact of individual opinions; 14. Effect and scope of the Court's case law; 15. Conclusion; Index.